I write these words from somewhere over the Atlantic Ocean, as I return home to New Jersey from a week-long trip to Israel. But am I really returning home? On the one hand the answer is a resounding yes. I long to reunite with my wonderful family back in NJ, can’t wait to get back to my comfortable suburban home, miss the various creature comforts that I left behind (I had to rough it without diet Snapple for a week! ), and look forward to re-starting the Torah teaching and learning that I do in my hometown. And I certainly can’t wait to get out of this cramped coach-class airline seat! Yet, I also feel like I am leaving, rather than returning, home. You shall possess the Land and you shall settle in it, for to you I have given the Land . . . This shall be the Land for you according to its borders . . . The Torah is telling us that our real home is the Holy Land. And in so many ways my soul feels at home in Israel, like nowhere else in the world. The Hebrew language, with its similarity to the language spoken by the prophets of 3,000 years ago and our prayers of today, is music to the ears. Streets named after the greatest men and women in Jewish history, taxi drivers who wish you “Shabbat Shalom,” major malls and highways that close in honor of the holy Shabbat, all bring joy to the soul. Above all else is the feeling that every step we take in Israel connects us to the monumental events and figures in Jewish history. Visit Hebron and reconnect with the patriarchs, matriarchs, and the very first human beings who ever lived. Visit the burial place of our matriarch Rachel; have your soul connect with her self-sacrifice and kindness, and beg her to continue to cry on behalf of her beloved children (see Jeremiah 31:14 with Rashi). Visit Tiberias and hear the echo of the footsteps of Talmudic sages, visit the burial place of Maimonides, and know that you are in a city whose beauty is extolled by the Talmud, and whose residents we are told are all filled with good deeds as numerous as the seeds of a pomegranate (Talmud Megillah 6a). Visit Tzefat, city where the mystics walked, nay soared, and purify your body and soul in the magical spring water of the great Kabbalist R’ Isaac Luria, and feel the spiritual charge in the very air you breathe. To the best of my knowledge, none of this is available in New Jersey. Of course, Israel is not only about connecting spiritually to events from our past. Even today, it is very much a “desirable, good, and spacious land” with great beauty from sea to shining sea. Float in the salty Dead Sea waters in the south, swim or boat in the fresh waters of the Kineret in the north, and watch as ibex roam the hills of Ein Gedi. Furthermore, Israel is currently home to some of the greatest Torah scholars and institutions of Torah learning in the world. And while Israel has some neighborhoods that have the feel of a 17th century Eastern European shtetl, a ten minute walk will bring you to elegant modern Hotels. Israel is very much a magical mix of ancient charm and modern high-tech. And then there is the Western Wall. The very place where the world was formed, where Abraham and Isaac were ready to make the ultimate sacrifice, where Jacob dreamed of a ladder with angels and received G-d’s promise of protection, and where both holy Temples stood. I experienced all the above in one week. But nothing prepared me for my visit to the Western Wall on Friday night. Thousands of Jews, observant and not, Ashkenazi and Sefardi, young and old, men and women, streamed to the Wall to welcome in the holiest day of the week at the holiest place in the world. Looking around, I almost sensed the wall, which longs for its past glory, being comforted by the thousands of people gathered there. It was almost as if we were reassuring — don’t worry, we are coming home. Why be downcast? Why do you mourn? The feelings and experiences I describe are not unique to me. While I am on the way back to the US, my wife is still in Israel, leading a group of 22 women from our community on our inaugural MTL Women’s Mission to Israel. Of course each of the women is experiencing Israel from her own unique perspective, but all are connecting deeply and describe the experience as so full of meaning that no words can do it justice. Is Israel perfect? Far from it. 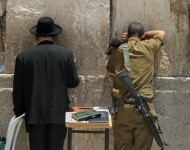 As long as G-d’s presence has not returned in its full glory, Israel will remain imperfect. But it is still our home. The screen says that despite flying for five hours I still have around seven hours left to the flight. The flight to Israel was only a little over ten hours total. While they claim that it has something to do with tail winds and flight routes, we know the truth. Flying to Israel we have the angels pushing us forward. Flying away from Israel the angels are trying to push us back. So follow the push of the angels. Visit your home away from home. Consider moving to it. Support it. Study about it. Love and cherish it. Especially in these days in the Jewish calendar which are set aside to remember Israel and Jerusalem. May it be so speedily and in our days.